Earnest RC Hudgins, Jr., was born on January 31, 1937 to the late Ernest Hudgins and Pincy Buttrum Hudgins in Gallagher, West Virginia. On Tuesday, August 14, 2018, God transitioned him to a new life with him in Heaven. 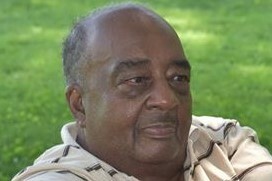 He was preceded in death by brother Joseph Hudgins and Janet L. Dean. Earnest moved to Pennsylvania when he was 16 years old; he worked for Lasko and eventually started his own construction business which he operated for over 50 years. He moved to Columbus, OH in 2008. You could find Earnest sitting in the garage or sitting downstairs reading his Bible, listening to gospel music or watching TV. He loved to go deep sea fishing. Earnest leaves to mourn his loss his wife, Janet A. Hudgins, married for 59 years; son Earnest Leroy Hudgins; daughter Lucinda Jeanne Westmoreland; brothers Paul Hudgins (Gloria), Robert Hudgins (Faye), Ralph Hudgins (Carolyn); sisters Lorene Easley, Carrie Matt, Queen Redd, Harriet St. John, Mary Holman (Lester) and Irene Hudgins; niece, Jeanne Rebecca Anderson; nephew Joseph H. Aerie III of West Chester, PA; grandchildren Christopher Walters, Brandon Walters, Darrien Hudgins, Patrisha Hudgins-Hunt, Janet Hudgins, Leigha Cortez, Lisa Hudgins-George, Brenna Hudgins, Damien Lee Hudgins, Madelynn Rose Hudgins, Jason Westmoreland and Jarrett Westmoreland; great grandchildren Makenzie Hunt, Marquies Hunt, Jr., Makyleigh Hunt, Amya Oxidene, Eric Cortez, Jodee Ann Cortez, Alecia Marie George, Preston Howard George, Avanna Anne Marie George, Phaidon Josiah George, in addition to a host of nieces, nephews, cousins, friends, and acquaintances. Visitation 8:30am and Funeral 9:30am Saturday, September 1, 2018 at New Covenant Believers Church, 3400 Kohr Blvd. Remembering the Hudgin family at this most difficult time. Please be assured that God will help you to endure this time of sorrow. Throw your burden on God and he will carry you through.